Could 2011 see Mike Portnoy get back in Beatles mode with Yellow Matter Custard? 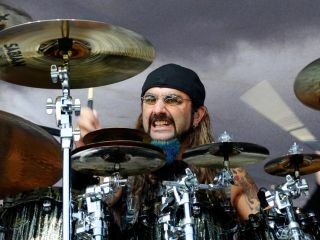 With his recent departure from Avenged Sevenfold, former Dream Theater drummer Mike Portnoy has fans across the globe wondering just what the multi-talented musician's next move might be. While his options are undoubtedly numerous, it's quite possible that Portnoy could cool his jets for a bit, stretch out and have some fun. And for Portnoy, fun has often come in the form of honoring his musical heroes. Over the years, he's formed tribute bands to perform the music of Rush (Cygnus And His Sea Monsters), Led Zeppelin, (Hammer Of The Gods) and The Who (Amazing Journey). But one of Portnoy's best-loved cover groups has been, not surprisingly, Yellow Matter Custard, a Fab Four outfit that also included Paul Gilbert, Neal Morse and Matt Bissonette. Although the band only performed a couple of gigs (one of which was recorded for the double CD, One Night In New York City), their reputation continues to grow. Earlier this year, MusicRadar asked Portnoy about Yellow Matter Custard. Interestingly, he indicated that we might not have heard the last from the Beatles tribute supergroup. How did you put together the setlist for Yellow Matter Custard? "I'll tell you, putting together that setlist was one of the most fun things I've ever done. It was a dream to go through The Beatles' catalogue and pick material to play live. One thing I really wanted to accomplish with Yellow Matter Custard was to play the kinds of Beatles songs you don't always hear from other cover bands. I wanted to go deeper into the catalogue and do some tracks that don't always get the attention they deserve. "I remember pulling out 40 songs and submitting them to the guys. I said, 'OK, pick 30 out of this batch, and whatever gets the most votes will be our set.' That said, I could easily do another Yellow Matter Custard gig tomorrow that would be comprised of 30 completely different songs, a whole new setlist, and it would be just as cool. That's how amazing The Beatles' catalogue truly is." What were some of your favorite Beatles songs to play? "It was all great, but man, it was a lot of fun to do You Know My Name (Look Up The Number). I mean, who has ever covered that song? I've heard so many Beatles songs in the world covered, but never that one. That was great to do. I also loved doing some of the Rubber Soul stuff. Think For Yourself was terrific - one of George Harrison's forgotten gems, in my opinion. We also did Wait from Rubber Soul, another rarely covered song from the same era. That was a blast. There might possibly be some bands out there that cover Wait, but I can guarantee you there's not many." What do you find particularly fascinating about The Beatles' music? "Oh boy, that could take hours to answer! [laughs] One thing I can immediately zero in on, though, and I think people don't talk about this enough, is that The Beatles had the most amazing bridges. Most bands can't write a really memorable bridge - you know, something that absolutely stands out. But with The Beatles, their middle eights were almost as good as their choruses! Take the bridges from Wait or No Reply or I Don't Wait To Spoil The Party - these are astounding, forgotten moments that so many people take for granted. Not one second was frivolous in a Beatles song. Each section was cool." How did you divvy up the singing duties? "Yellow Matter Custard was all about the vocals. People ask me how long it look us to rehearse the music, and I tell them, 'Hardly any time at all.' The music, we had that in our blood. So yeah, the hard part came when we had to decide who was going to sing which song. We weren't taking on the characters of the individual Beatles; otherwise, I would have been fucked - I would've been stuck singing Act Naturally and What Goes On. [laughs] I mean, as much as I love Ringo, I didn't really want to sing those songs. "Vocally, we split up the tunes a bit randomly, although we did take into account everybody's ranges. It was so much fun. I would love to do another Yellow Matter Custard gig. I would love to cover whole albums, too, like Rubber Soul and Revolver. At this point, everybody's done Sgt. Pepper, and I've heard a few bands do 'The White Album.' But that middle period would be a lot of fun to explore."